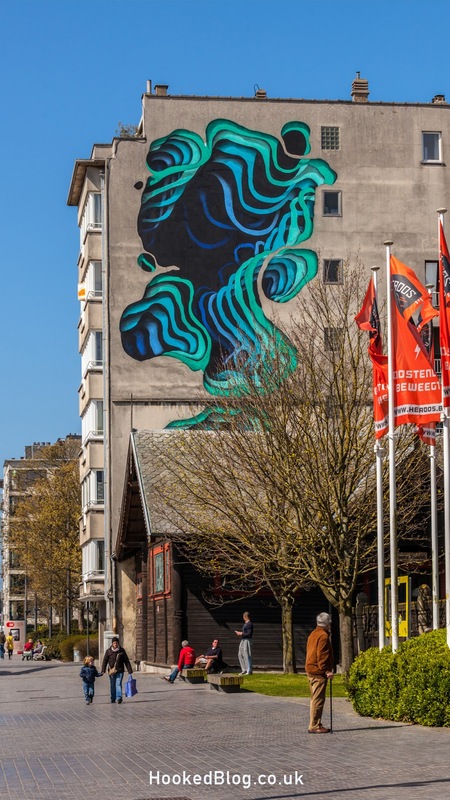 International street artists are beginning to make their way to the costal city of Ostend to join their Belgian counterparts for the contemporary art festival The Crystal Ship. 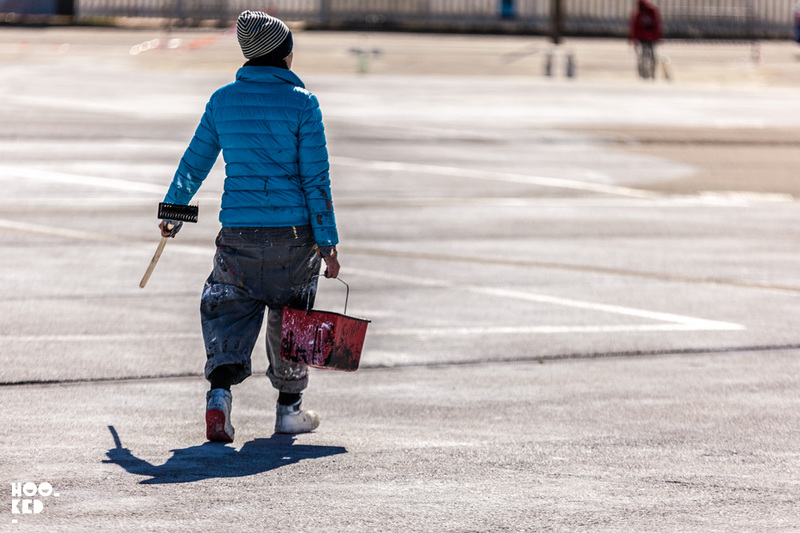 Set to open on April 7th at Monacoplein many of the invited street artist have already started work on the walls and streets of the city by the sea, adding to the collection of more than 40 permanent artworks and about fifteen large scale murals installed around Ostend. Fifteen new works will be added this year which along with the work from the two previous editions form an impressive art trail throughout Ostend. All the artworks created during the festival remain permanently in the public domain and can all be visited freely. Visitors and locals are invited to stop by the cities Tourist Office (Monacoplein, Ostend) where they can pick up a free map which will guide you through the open-air exhibition. 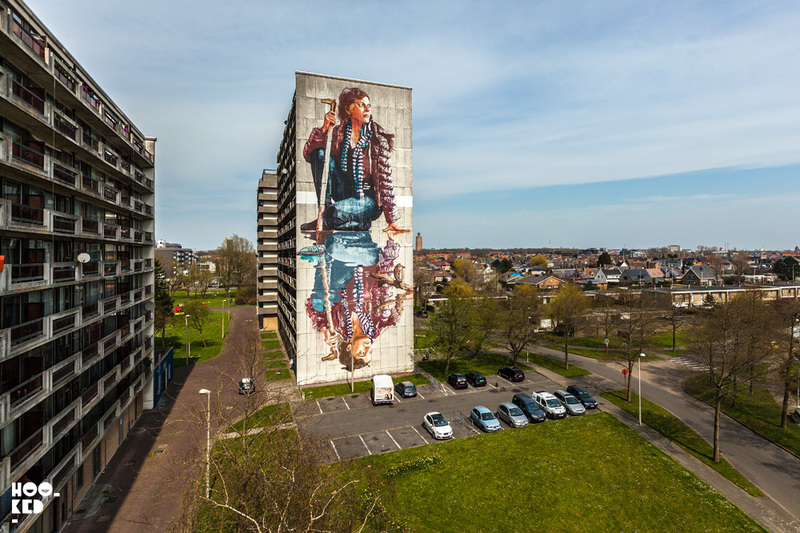 This huge mural just outside Ostend city centre was paint by Australian artist Fintan Magee for the first edition of The Crystal Ship Festival in 2016. See More: Fintan Magee's ‘Monument to a Disappearing Monument’ Mural in Norway. 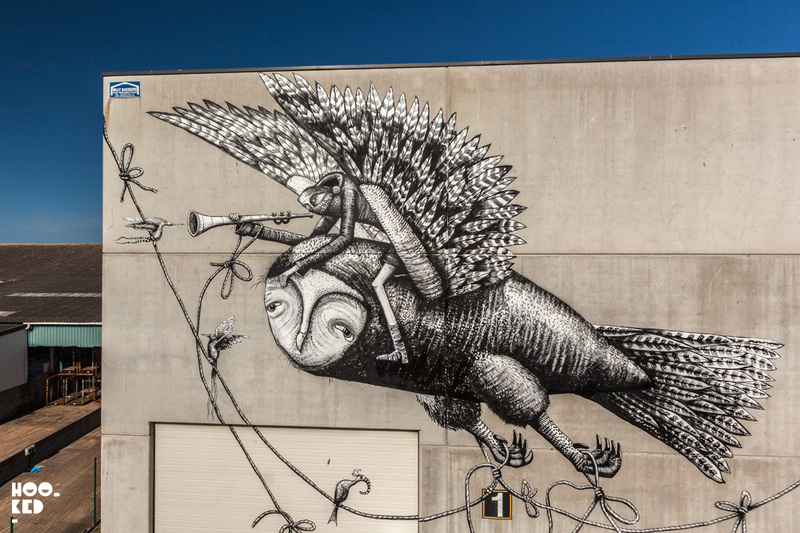 London based street artist Phlegm visited Ostend in 2017 adding some of his magical black and white characters to the cities walls. Above is a section of a much larger wall he painted while in town. 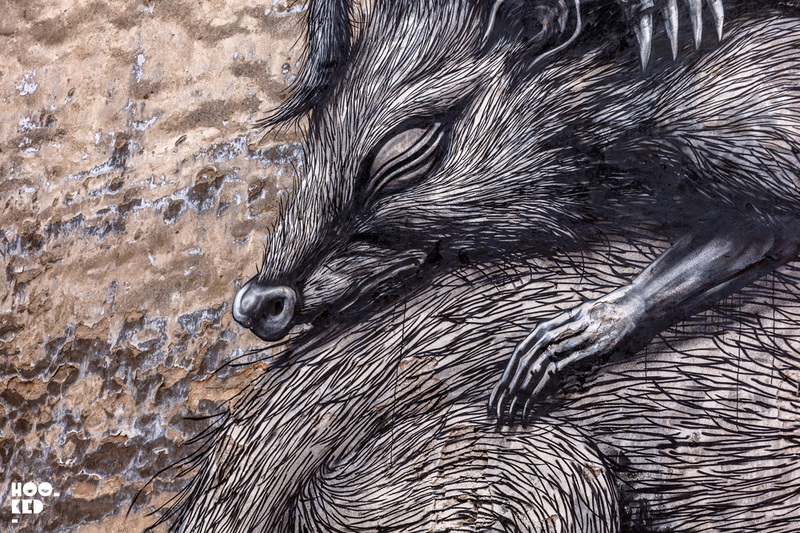 Pictured above is a small section of a larger wall painted by Belgian street artist ROA. 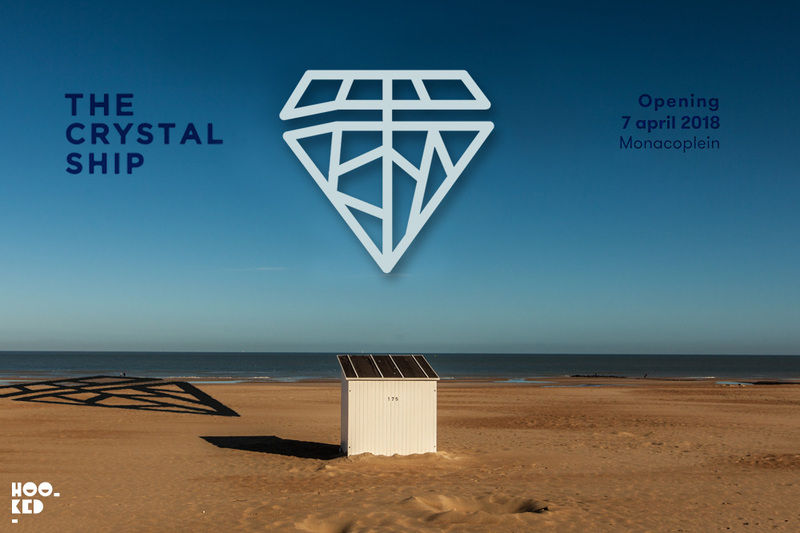 The 2018 edition of The Crystal Ship will be based at Monacoplein 2, 8400 Ostend, Belgium, where you can pick up a copy of the free map and get additional information on the festival exhibition and the street art guided tours. 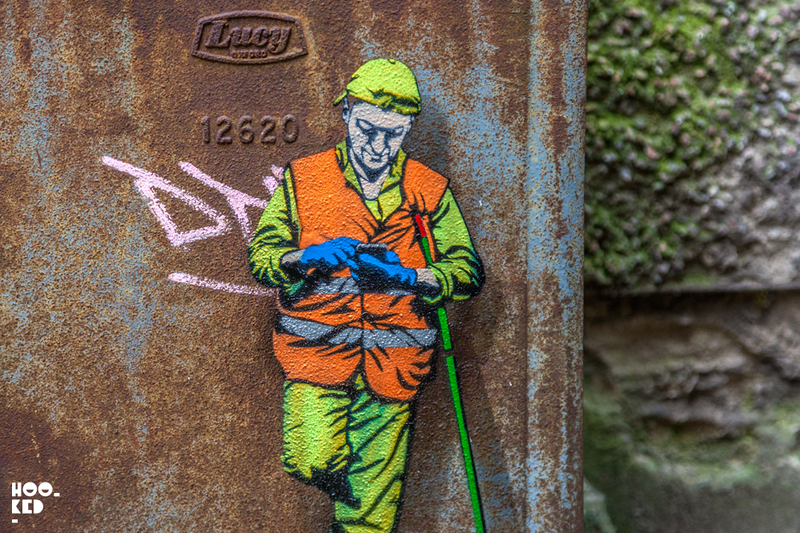 One of Belgian street artist and urban interventionist, Jonathan Pauwels aka Juane's sanitation workers taking a mobile phone break! Checking in on our Instastories!! Hookedblog will be in Ostend for a couple of days and we will be bringing you coverage from The Crystal Ship Festival across our social channels so be sure to join us on Hookedblog Twitter and follow our daily adventures via our Hookedblog #InstagramStories on Instagram. We will also be sharing images on the blog from our trip for those of you not using Instagram, so stayed tuned. And if any of our readers are planning to visit the festival please let us know and we can catch up for a Belgian beer or two while we are in town! The striking work of German street artist 1010 from a previous edition of the festival taking over several floors of this building which can be seen at Prinses Stefanieplein 63, Ostend, Belgium.